The thermodynamic energies of left and right handed DNA. The story of Monastral is not about a character in the Magic flute, but is a classic of chemical serendipity, collaboration between industry and university, theoretical influence, and of much else. Fortunately, much of that story is actually recorded on film (itself a unique archive dating from 1933 and being one of the very first colour films in existence!). Patrick Linstead, a young chemist then (he eventually rose to become rector of Imperial College) tells the story himself here. It is well worth watching, if only for its innocent social commentary on the English class system (and an attitude to laboratory safety that should not be copied nowadays). 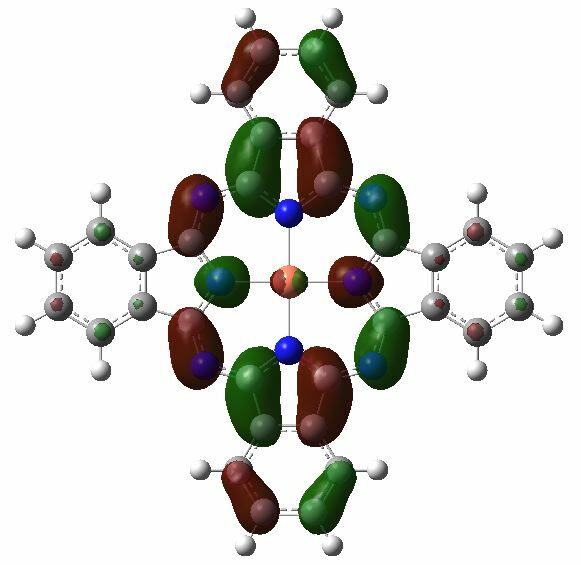 Here I will comment only on its colour and its aromaticity. In 1933, Hückel was still thinking about his molecular orbital electronic theory of benzene, but for ~15 years, there remained little need for the rule we now know as 4n+2, because n was invariably equal to 1 for most known aromatic molecules! It was only the discovery of so-called non-benzenoid aromatics in the 1940s (e.g. 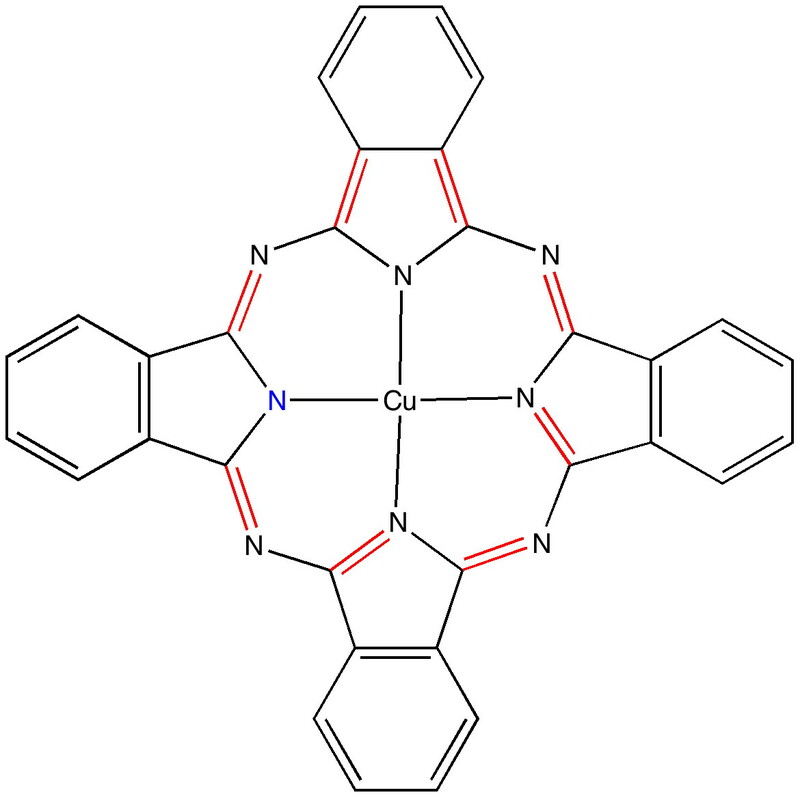 Dewar’s tropolone structure) that propelled chemists to identify aromatic molecules with other values of n. And Monastral blue is a prime example of n=4 (although it would be of interest to find out when it became so associated with the Hückel rule). 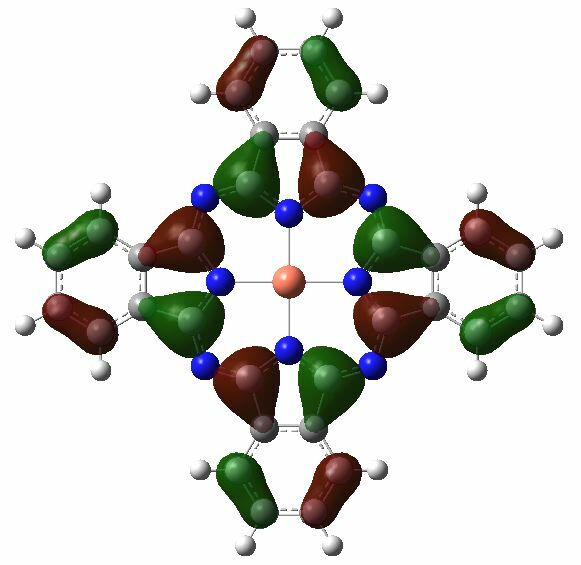 If you count the red bonds above, there are eight, along with one lone pair of electrons located on the highlighted (blue) nitrogen atom. This makes 18 π-electrons in the ring, or 4×4+2 (there are paths other than the one shown, but they give the same count). 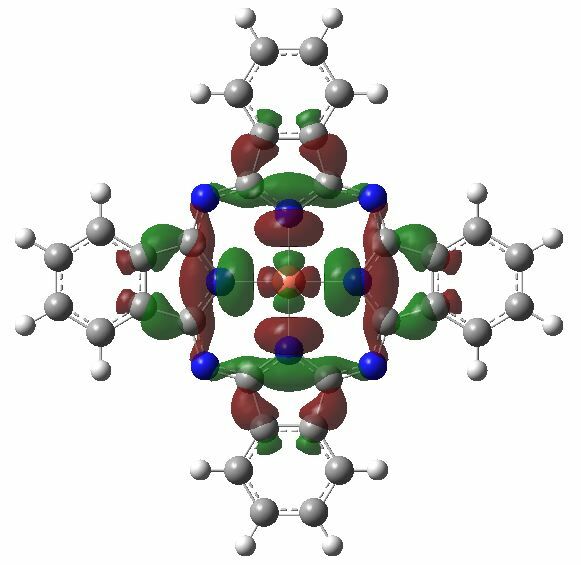 Part of the reason for the remarkable thermal stability of this molecule must be its aromaticity. So what about the colour? The visible spectrum is shown below, with λmax ~ 610 and 710nm. 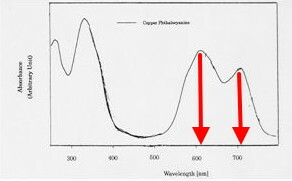 Visible absorption spectrum of copper phthalocyanine. The unpaired electron in copper phthalocyanine occupies the following rather interesting orbital, which appears not to be involved in its blue colour. So, just as with mauveine, a mystery remains. The colour of Monastral blue is not monochromatic, in that it appears to be caused by two bands in the 600-700 region. Calculation however reveals it to have only one band at 610nm. What is the other one? This entry was posted on Tuesday, March 8th, 2011 at 5:50 pm and is filed under Interesting chemistry. You can follow any responses to this entry through the RSS 2.0 feed. You can leave a response, or trackback from your own site. This is the predicted Visible spectrum of the cation. λmax is ~410nm. This therefore does not explain the presence of a peak at ~710nm. I have also tracked down a very recent experimental spectrum (DOI: 10.1016/j.tca.2010.01.019) which is shown below. The caption to this figure indicates it as spectrum (b) measured in solution (solid line) and as films on quartz substrate before (dashed lines) and after annealing in vacuum at 220 °C (dotted lines). This might indicate that in solution, solvent coordinates in the axial positions to the metal, and that in the solid, stacking and crystal modification is important. λmax has not shifted much. Sothe 710nm peaks is not due to this. 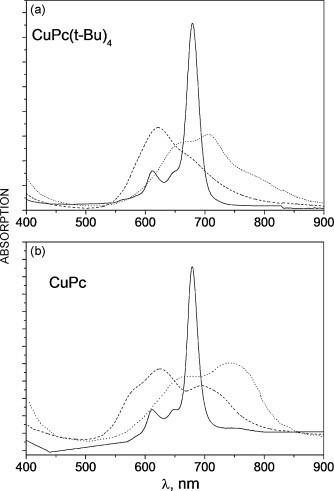 … so i suspect that if you were to model a stacked CuPc dimer or more likely a trimer than you may be able to account for the second, longer wavelength abs band. Monastral: the colour of blue is licensed by Henry Rzepa under a Creative Commons Attribution-Noncommercial-Share Alike 3.0 United States License.